This newest title in Walter Foster's Drawing Made Easy series makes it possible for aspiring artists to recreate an impressive array of horse and pony drawings. From a grazing Appaloosa to a Standard-bred Trotter in action, accomplished artist Patricia Getha includes tips and techniques for drawing a range of exciting breeds and their signature poses. In addition to teaching basic pencil techniques, Getha also details how to enhance drawings with charcoal and watercolor washes. Each project features easy-to-follow steps, so artists of any skill level can follow along with confidence. 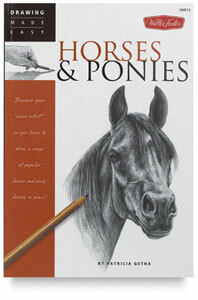 Full of inspiring artwork and effective instruction, this book is an absolute essential for all horse-loving artists! As a young girl, Patricia Getha spent many summers looking after and showing horses. Drawing played a large role in her life from an early age, but it was a love of horses that enabled her to master the subject. With formal training in commercial and graphic arts, Getha is proficient in a variety of media, including watercolor, graphite, oil, and colored pencil. She is active in juried competitions and has won several awards for her exquisite equine artwork. Getha currently resides in Ohio and works primarily as a commission artist.